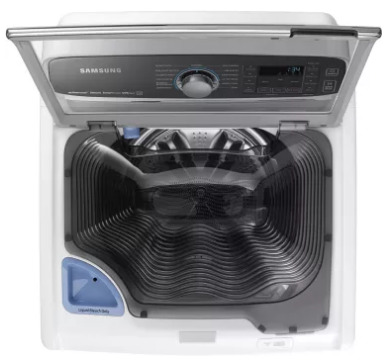 Samsung's activewash™ washers feature a built-in sink with a powerful water jet, allowing you to soak and pre-treat your clothes before adding them to the washer. When it's time to wash, you can choose from 13 different pre-set cycles to accommodate laundry of all types. 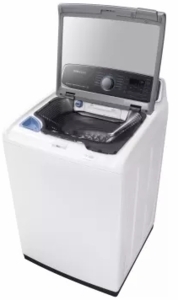 Cycles include Normal, Bedding/WaterProof, Heavy Duty, Permanent Press, Steam Sanitize, Colors/Darks, Brilliant Whites, Active Wear, Delicates/Hand Wash, Quick Wash, Rinse + Spin, Spin Only and Deep Wash. A 3-tray dispenser dispenses main wash, fabric softener and bleach. For a cleaner washer (and cleaner laundry! ), Samsung's Self Clean cycle obliterates residue buildup within the washer drum. VRT Plus™ technology keeps the washer running quietly, while Smart Care technology allows you to troubleshoot potential malfunctions right from your smartphone instead of flipping through the manual. This washer is ENERGY STAR® certified, meaning it's both environmental and economical - you'll benefit the environment by reducing energy consumption AND you'll save a small fortune in utility costs. 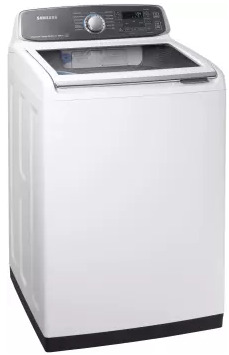 The built in activewash™ sink allows you to pre-treat your clothes before putting them in the washer. Don't have space in your laundry for a utility sink With activewash™, it's already built right into your washer. For above-and-beyond clothing care; steam technology gives your washer even more fight against stains, odors and wrinkles. Reduces vibrations 40% more than standard VRT™ washers. 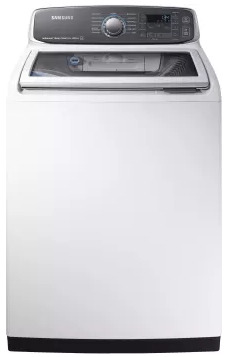 Less vibration means less noise, and a more peaceful laundry day. A cleaner washer means cleaner clothes; The self-clean cycle rids the wash basket of residue buildup. Smart Care Samsung appliances allow you to troubleshoot potential problems with your appliance without having to consult the heavy manual. With the Smart Care app, you can simply point your smartphone at the control panel and it will interpret the error code and tell you the necessary steps for troubleshooting. Features trays for dispensing main wash, fabric softener and bleach. ENERGY STAR® products exceed federal guidelines for energy efficiency. Owning an ENERGY STAR® washer means you're not only helping the environment - you're saving a small fortune on energy costs over the washer's lifetime.